Frederick Theodore Frelinghuysen was appointed Secretary of State by President Chester A. Arthur and served from December 19, 1881, to March 5, 1885. Frelinghuysen was born at Millstone, New Jersey on August 4, 1817. He graduated from Rutgers College (now University) in 1836. His uncle and adoptive father Theodore Frelinghuysen was a Senator from New Jersey and Vice Presidential candidate on the Whig ticket in 1844. Frelinghuysen studied law and was admitted to the bar in 1839. He served as Attorney General of New Jersey from 1861 to 1866, and as U.S. Senator from New Jersey from 1866 to 1869. Although he was not re-elected in 1869, he ran successfully in 1870, and served from 1871 to 1877. In 1877, Frelinghuysen served on the Hayes-Tilden Electoral Commission. He worked in a private law practice from 1877 until he was appointed Secretary of State by President Chester A. Arthur. Frelinghuysen served until the end of Arthur’s term, resigning on March 5, 1885. As Secretary of State, Frelinghuysen inherited a number of diplomatic issues from his predecessor, James G. Blaine. He continued Blaine’s unsuccessful attempts to mediate peace negotiations between Peru, Bolivia, and Chile. Frelinghuysen appointed Cornelius A. Logan as Minister to Chile. Logan mediated the 1883 peace agreement between Chile and Peru, terminating the War of the Pacific with the Treaty of Ancón on October 23, 1883. Despite the achievement of peace, diplomatic blunders in Chile and Peru and Bolivia’s territorial losses remained an ongoing source of tension between the United States and South America. Against President Arthur’s wishes, Frelinghuysen canceled the Pan-American Conference that Blaine had organized before his departure. Arthur brought the issue before Congress, which took no action, and the invitations for the conference were withdrawn. Frelinghuysen remained concerned that past U.S. actions had encouraged negative attitudes towards U.S. power and suspicion of possible intervention. He also remained wary of being drawn into mediating disputes between neighbors. These concerns prompted the U.S. Government to refuse to arbitrate in the emerging boundary dispute between Venezuela and Britain over Guyana’s western border. Concerned about European construction in the Panama Canal, Frelinghuysen unsuccessfully attempted to renegotiate the 1850 Clayton-Bulwer Treaty with Great Britain. He negotiated an 1884 treaty with Nicaragua granting the United States exclusive rights to construct and control a transoceanic canal—terms which directly contradicted the Clayton-Bulwer Treaty. The U.S. Senate failed to ratify the treaty. In addition to his efforts in Latin America, Frelinghuysen also instructed delegates to the 1884 Berlin Conference, where German leader Otto von Bismarck sought to mediate the European scramble for Africa. Frelinghuysen also oversaw and approved Rear Admiral Robert Shufeldt’s attempt to secure a treaty with Korea. 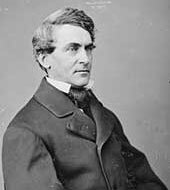 Frelinghuysen served as Secretary of State until the end of Arthur’s term and died shortly afterwards in Newark, New Jersey, on May 20, 1885. Commissioned to London; declined appointment.